Good news from LMI: KTM9 water based lacquer has shipped from the manufacturer. Availability to me starts January 9th. 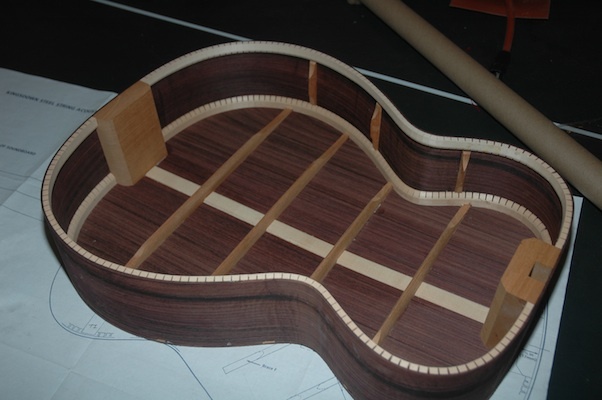 Did some packing of the uke after fully prepping it for lacquer finish. I’ve sent it off to Athens, GA for finishing. The box for the OM aka “Bob” is closed in. I did neglect to install the electronics, but justified my mistake by saying that I need practice installing these after the fact anyway, so we all say. First, completed sanding and prepping the back and sides to accept the top. 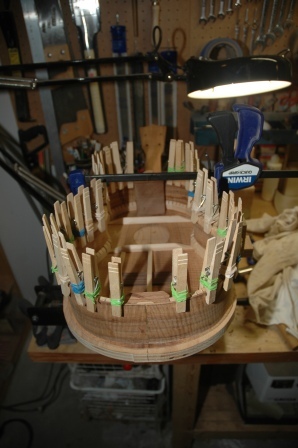 In the past I have wreaked havoc on spruce tops while bracing. I learned since to mask the top while I’m bracing to avoid dings and dimples. Hey, it was from a calendar my WIFE gave me. 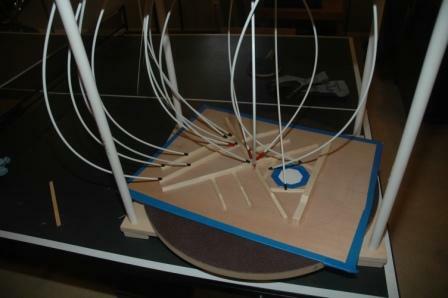 The top is all braced and trimmed back ready for installation. A couple of hours to dry, then I can cut off the scarf and start thinking about the binding and purfling. Yeah, Guitar Camp was awesome, and now I’m home counting the days before I start back teaching. I took a uke and an OM to camp, and as usual garnered a lot of interest from fellow campers who claim they “must have one”. On the last day of camp advice is given to those of us returning to the non-camp world. One bit of proper advice was, “Wait three weeks before accepting a proposal of marriage from a fellow camper.” Same goes for committing to a new uke or guitar. I’ve resumed where I left off before camp. 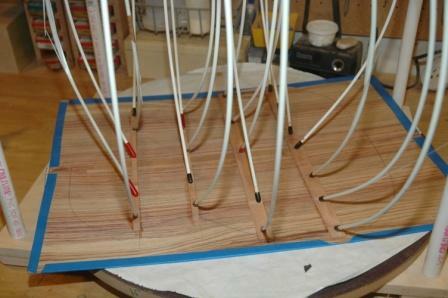 The Hybrid for Jim has a first coat of pore filler (an epoxy resin) and is lined up for the spray booth. 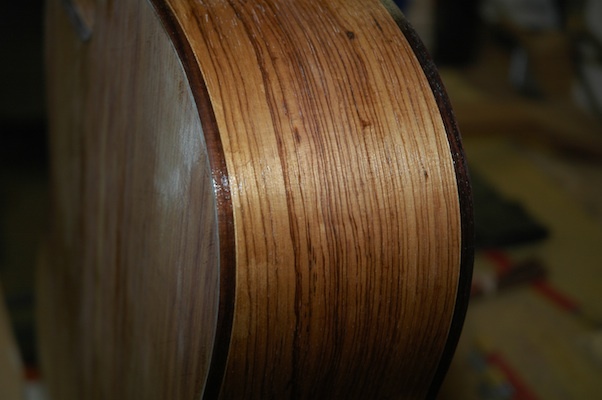 I’ve installed all binding on the Myrtle Parlor. I then did what all good builders should do, I burnished my cabinet scraper. Ah, what a difference! 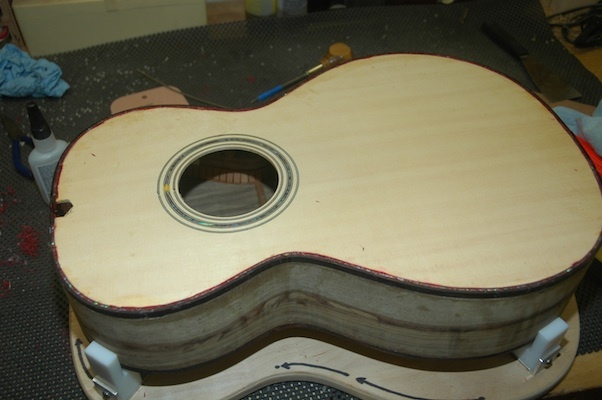 Several smooth strokes across the top, and the binding is trimmed flush with the top. I’m so in love with my first uke. I played it at camp and caught the bug. The uke I’m working on now is really for me (so I’m differently motivated). 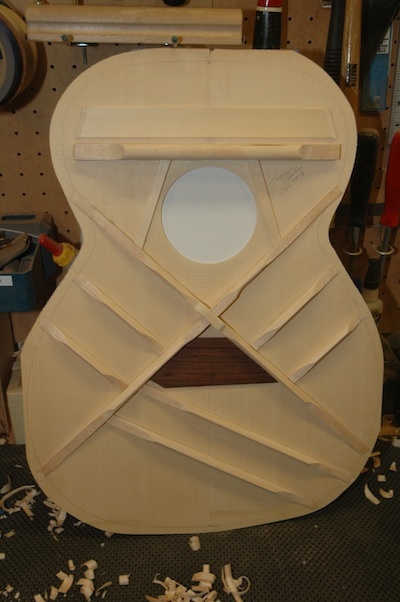 The top is braced, the tonebars are installed and the neck and top have been joined. 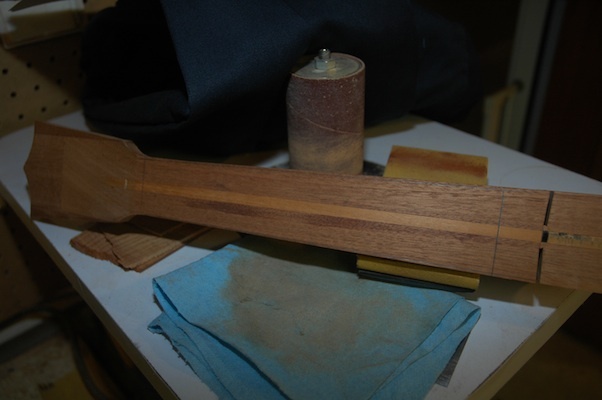 The neck has been stabilized with a graphite rod which lives under the mahogany strip in the center of the neck. 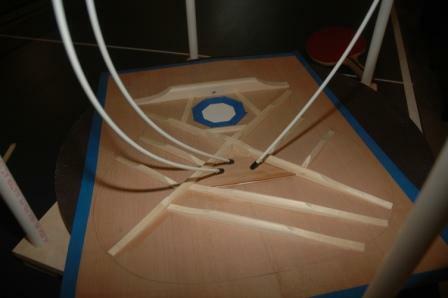 First the bracing and bridge plate were installed. Finally, the neck and top can be joined. 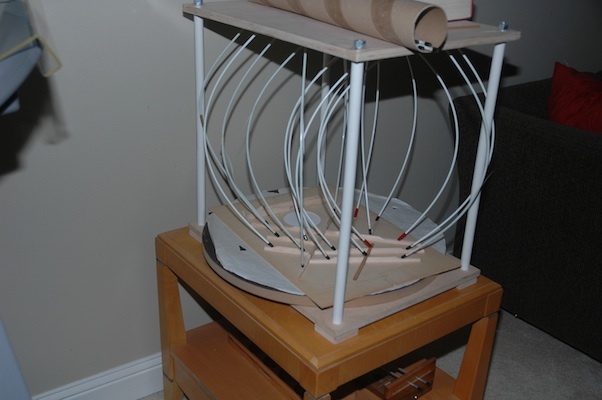 Bracing is installed and trimmed, awaiting final sanding. Bridge plate installed and X-brace patch installed. 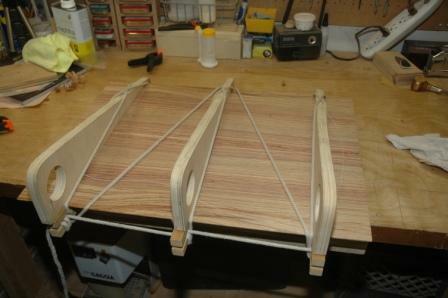 All back bracing and top bracing/tonebars have been installed (glued and clamped). The braces have been pre-shaped for minimal chiseling. After further shaping, and feathering the ends down toward the edges, I will install an x-brace patch over the joint, then sand. The bridge plate will finally be installed prior to joining back, sides and top. 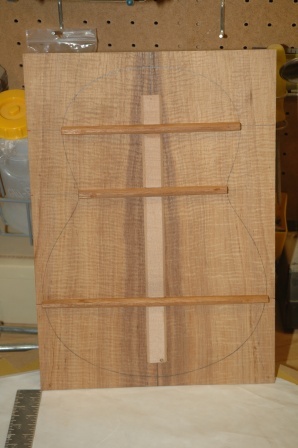 I have begun the process of finger planing/shaping the back braces. 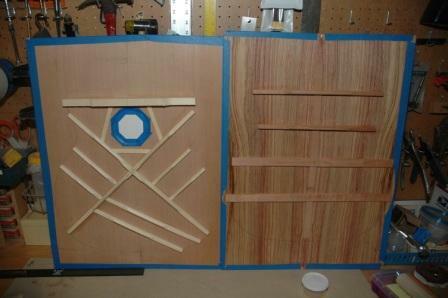 I’m also 75% complete on gluing/clamping all the top braces. 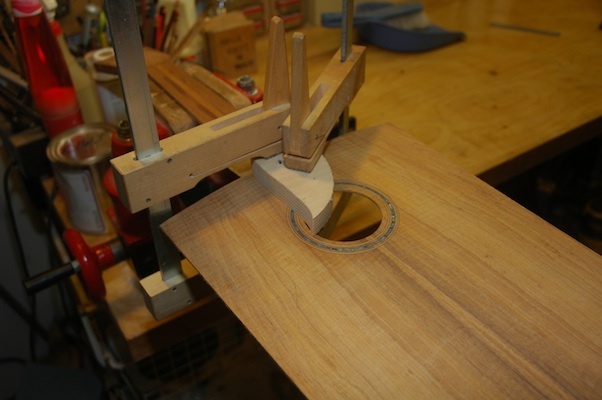 I’m heavily preshaping the top braces as my past experience has been that this is a more efficient method than planing/shaping after the braces have been installed. The owner of 1001 dropped by to request a tweak. His open A string had the dreaded wolf-tone which was really a small gap underneath the nut on the fretboard side. A simple filing of the nut slot to release the gap fixed the problem. 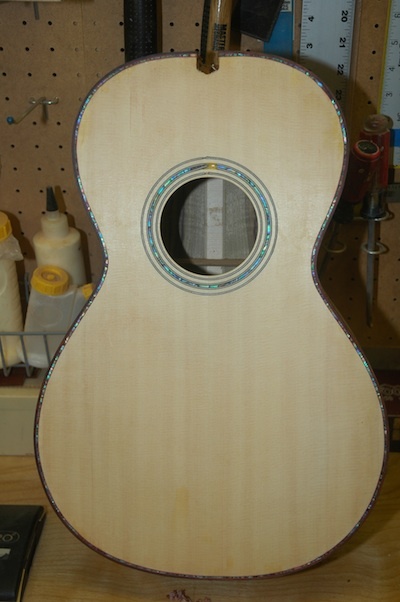 I’m also continuing to apply lacquer filler to the headstock for the 12 string Ovation repair. I’ve reattached the sheared headstock, repaired are relacquered the truss rod cover, and after the lacquer filler cures I’ll spray several coats of touch up lacquer then sand and buff. It should be ready later next week. I would like to get this back to the customer before we head out to Alaska for our RV adventure. 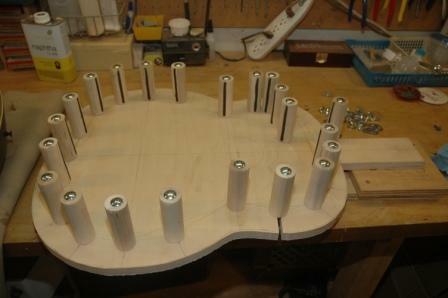 I completed the side supports for the workboard for Guitar 1002. 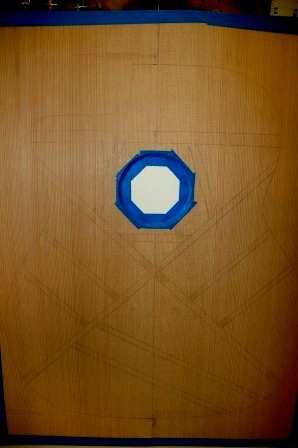 The workboard is an alternative to the body mold which I have used for previous guitars. 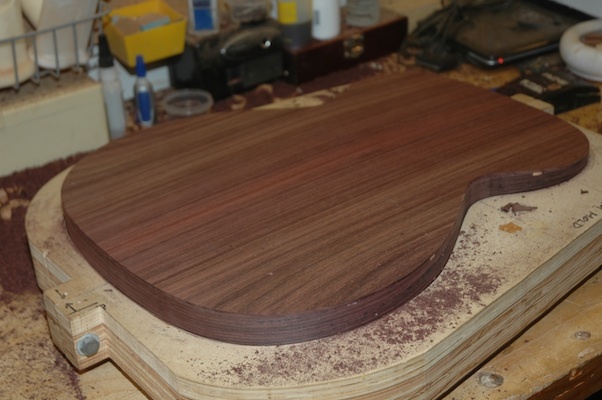 As I’m using a Spanish Heel, the neck will be attached to the top plate before the sides are installed. 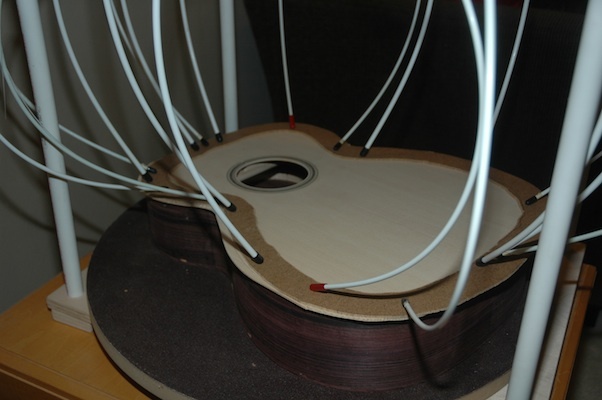 The workboard allows the top and neck to be secured. 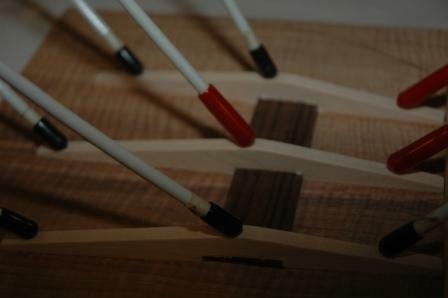 Each dowel side support will be in a slot to allow adjusting the position to create the final and proper shape for the sides before gluing to the top. I will also need to dish out the lower bout area of the workboard to accommodate the radius bulge of the top from the X-bracing. I have rough cut all the bracing. The top bracing will be spruce, and back bracing cedar. 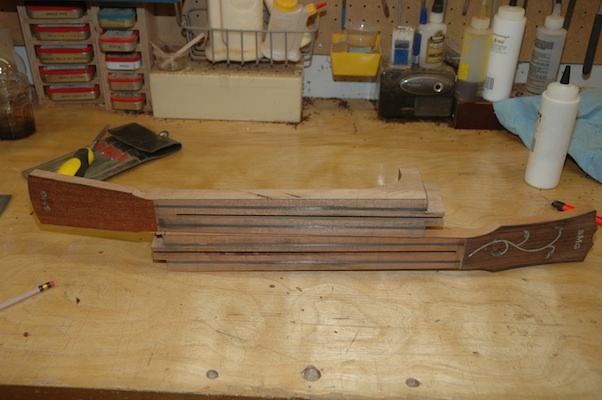 The back bracing is radiussed to 15′ before gluing. 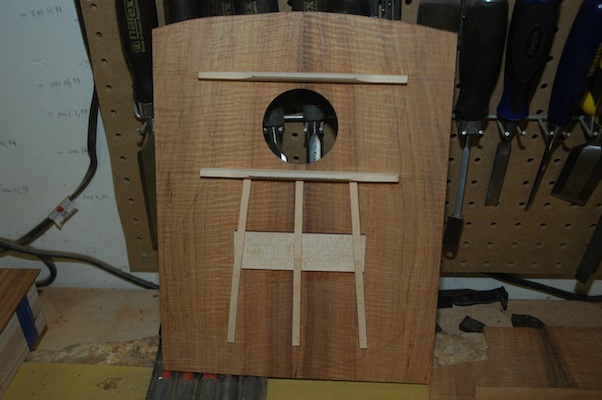 I used the drum sander to bring the back plates down to .090″ then jointed and joined in the spanish joiner jig. 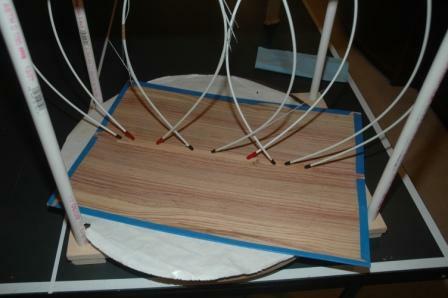 After drying, the joint was sanded, a protective posterboard cover was taped to the outside, and the center strip was glued using the go-bar clamp. The top was similarly protected with posterboard (I’ve dinged too many top plates) and the bracing pattern was pencilled in. Got a lot done today between printing lesson plans and teaching 9th graders how to divide exponents. I planed and radius sanded the back until it was in shape to accept kerfing. 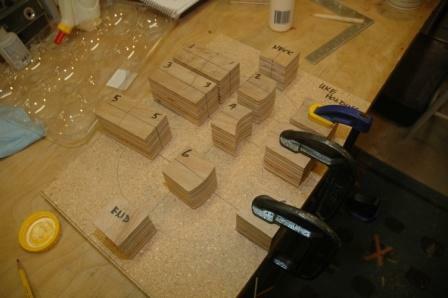 Lots to do on the inside before gluing on the back. Side reinforcements go in, three to a side. 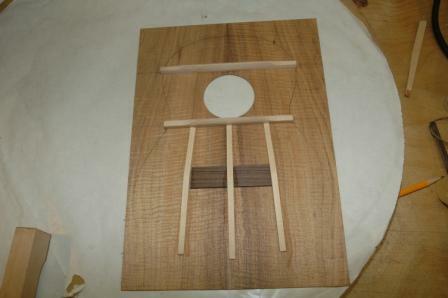 The soundhole needs to be reinforced with two spruce braces. The ladder bracing on the back was trimmed back, and a label was secured to the back as well. 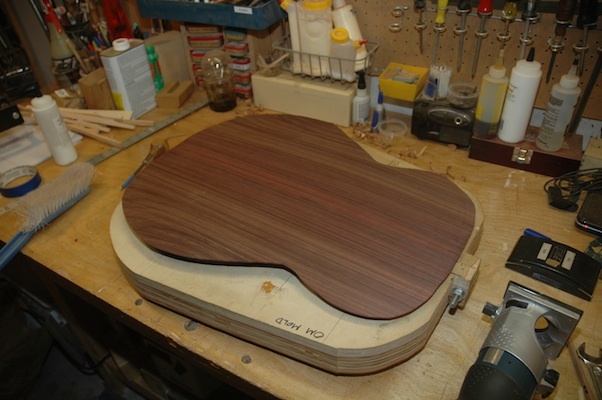 The soundhole is too small to get my fat mitts into to glue in the label, which is what I usually do with guitars. The back was trimmed down at the waist to accomodate a clamp to press in against the side waist to square up the sides. 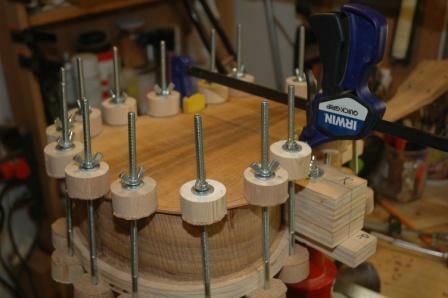 The back is glued to the kerf and held down with spool clamps. 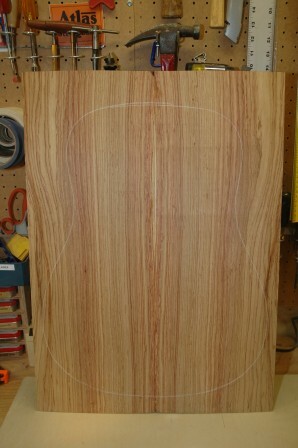 Later tonight, after the glue dries, I’ll flush up the sides and it will appear to be a ukulele. I completed the bracing for the back and top today. 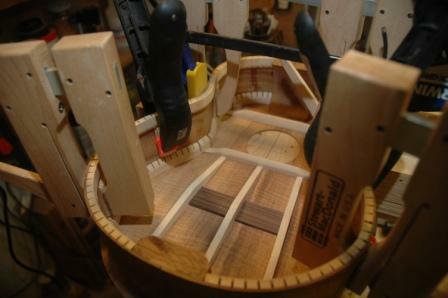 The bridge patch is rosewood, and the bracing for the top is flat (not radiussed) using sitka spruce. 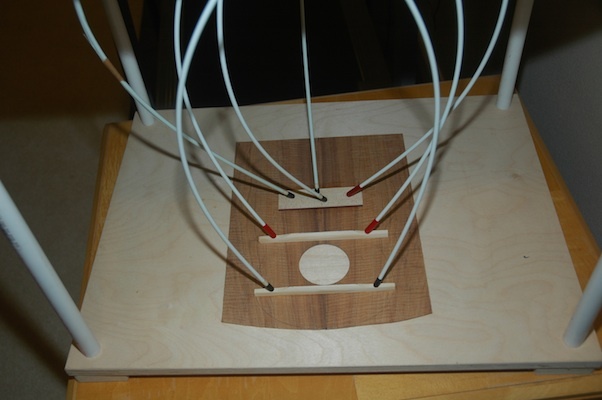 The back is braced with 15′ radiussed mahogany ladder bracing. 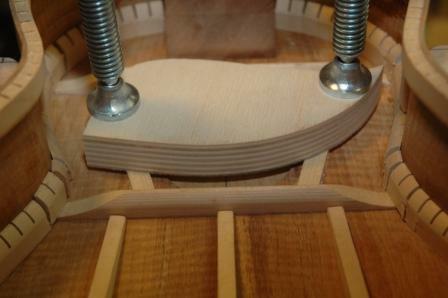 My dyslexic brain allowed me to cut the slots in the neck for the spanish heel at the opposite angle. The plan for recovery is complicated and will require me to build a jig to hold the neck and accurately cut the correct slots. 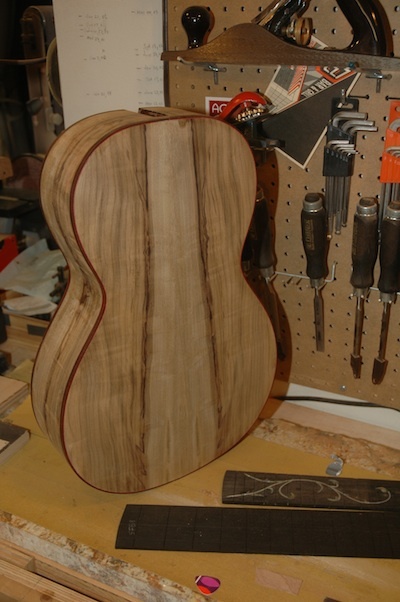 First I’ll patch the “bad” slots to return material to the neck block before I cut new slots. 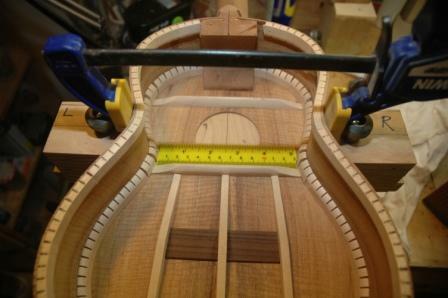 The fortunate aspect of this problem is that the patch will only be visible inside the uke where the heel meets the sides.